For a birder, one of the joys of living in SaddleBrooke is the incredible diversity of nearby birding sites. Sweetwater, a waste water reclamation area practically in downtown Tucson, is rich with ducks, shorebirds, migrants and Yellow-headed Blackbirds. Just fifteen minutes from SaddleBrooke, Catalina State Park covers 5,500 acres of Sonoran Desert saguaros, and has a bird list of 200 species including sought-after ‘lifers’ like the Rufous-winged Sparrow and Crissal Thrasher. The national record for most hummingbird species recorded in a single day (14) was set at Beatty’s Guest Ranch in Sierra Vista, and a day on Mt. Lemmon takes one through six different life zones, each one showcasing unique birds. Although touring Mt. Lemmon is an all-day commitment, many of the mountain’s lower elevation birds can be found much closer, in Peppersauce Canyon. Peppersauce Canyon is an oasis on the backside of Mt. Lemmon, just seven miles beyond Oracle State Park, which is currently closed except for weekends from February 2, 2013 through April 27, 2013, and again in the fall. A National Forest Campground sits in this treed oasis with both individual and group camp sites, picnic tables and pit toilets. Both overnight ($10) and day use ($5) fees are halved for Golden Age Passport holders. If you’re curious about the canyon’s name, in 1880 a camper, Alex McKay, reported that his hot sauce was missing when he broke camp here. It must have been a slow news day. At 4,600 feet elevation, the campground is cool and shaded by enormous Arizona sycamores, and an ideal and inviting spot for a picnic lunch. The road continues past the campground up the back side of Mt. Lemmon, an adventure in itself that requires a high-clearance vehicle. You don’t need a Jeep to get to the campground, though, as long as you don’t mind driving the family car on five miles of dirt road. To get to Peppersauce, drive north from Tucson on Highway 77 and turn right into Oracle on American Avenue. Follow American to the sign to Oracle State Park, on the right and across from a grocery store. The pavement ends two miles beyond the park, and the dirt road continues five miles to Peppersauce, passing an Arizona Trail crossing and the post office at American Flag, the oldest territorial post office in Arizona, which closed in 1890. The dirt road traverses hills of desert scrub, well worth pausing to bird, and crests on a ridge looking down into a grove of giant sycamores at the campground. If you are not planning to picnic in the campground, you can park to the right of the entrance. Birding is excellent within the campground, and along the mine trail which follows the wash beyond the parking area. Bird the campground first, following the road back to the gate into the boy’s ranch, turn right to the group camping area and follow the wash back to the entrance. At the entrance, cross the road and follow the mine road up the wash, returning the same way. The trail is rocky, but the climb is gentle and easy. A small spring lies about one and a half miles up the trail, a site that often attracts birds that might not be seen otherwise, such as Lazuli Bunting and Painted Redstart. 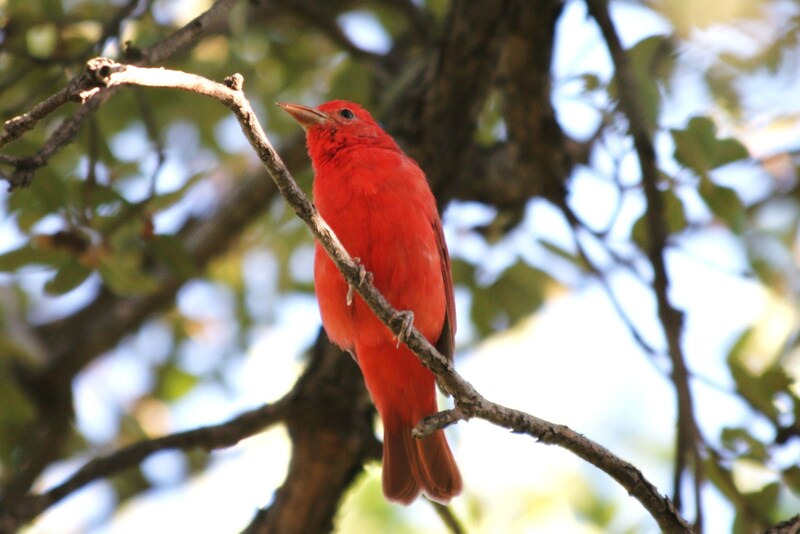 The campground in late summer is a favorite for Summer and Western Tanagers, Acorn Woodpeckers, Bell’s Vireos and migrating warblers. 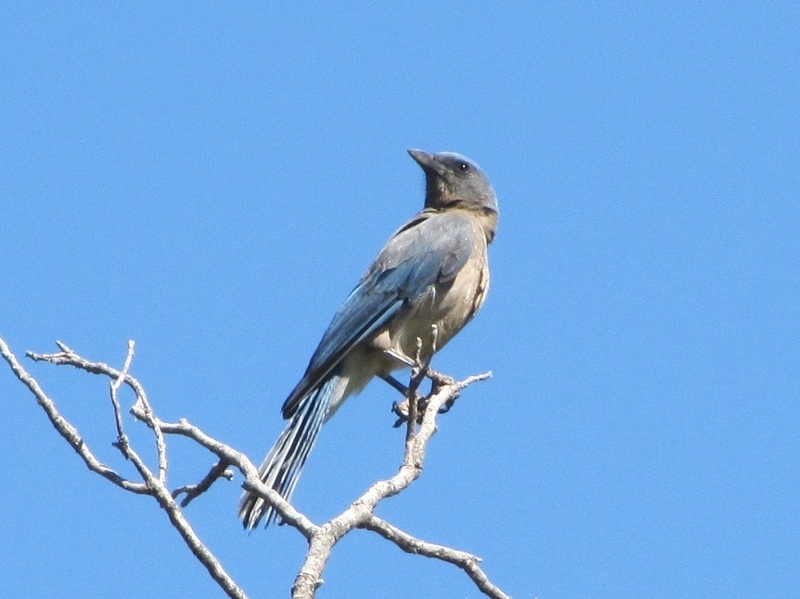 Both in the campground and along the trail look for Western Scrub-Jay, Mexican Jay, Bridled Titmouse, Northern Cardinal, Cedar Waxwing and Northern Flicker. Warblers found in the area include Wilson’s, Townsend’s, Nashville and Hermit. A recent SaddleBrooke outing also found Olive-sided Flycatchers, a Swainson’s Hawk, Black-headed Grosbeak, Cassin’s Vireo and White-breasted Nuthatch. This is the place where a Broad-winged Hawk was found two years ago, only the twenty-fifth documented sighting in Arizona. The campground is rarely occupied mid-week, but look for Carlos, the former campground host who now works at the boy’s ranch. He has some great stories. Like the time a rabid bobcat jumped on him, bit his chest and wouldn’t let go until Carlos beat him off with a pistol. Carlos says folks used to drop unwanted cats in the campground, too, which attracted mountain lions, so they put a stop to that. Carlos claims that mountain lions eat everything on a cat except its legs. He even showed me a spot above the campground where he found 24 cat legs one morning. On our last bird walk in Peppersauce, we were a mile up the mine trail when the trail crossed the wash. Lying in the center of the trail was a young deer’s foreleg. The sun was high and the birds were lying low. Seemed like a good place to turn back. This entry was posted in Birding Arizona, Uncategorized and tagged mt lemmon arizona, national forest campground, nature, outdoors, Peppersauce canyon arizona. Bookmark the permalink.